Capped Bust, Reeded Edge half dollars are an unusual breed of coin, produced for only four years. Although they are clearly similar to the Capped Bust, Lettered Edge halves, they were made using an altogether different method of manufacture. Accordingly, these are a new type, but are closely related to the 1807-1836 Capped Bust, Lettered Edge series. There are two new types, each with different styling of the denomination on the reverse. 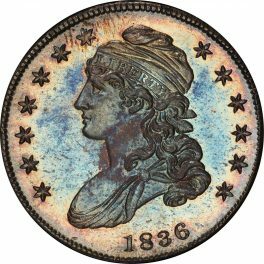 History and Information: In 1836, the Philadelphia Mint obtained a steam press that vastly improved production speed and allowed for edge reeding to be imparted on the coins at the time of striking. Prior to this a two-step process was required with edge lettering applied first to blank planchets via a Castaing machine after which the planchets were struck by the screw press, which had been used since the inception of the U.S. Mint. The Capped Bust, Reeded Edge half dollars have the honor of being the first U.S. silver coins made with this new technology. In addition, the new steam press, made locally in the style developed by Thonnelier in France, produced coins with diameters that were much more consistent, allowing for greater ease in stacking. The steam press had been set for inauguration on Washington’s Birthday, February 22, 1836, and medalets with this date were made. However, it was not ready for production use, and the ceremony was held on March 23, with medals struck from the same dies, but with the date changed. Though, the Capped Bust, Reeded Edge half dollar would be a short-lived series with just five regular issues, the reverse design would be closely replicated on the Liberty Seated design used from 1839-1891 and also designed by Gobrecht. The Capped Bust, Reeded Edge half dollars are based on the predecessor design created by assistant engraver John Reich in 1807. Though widely collected and loved today, Reich’s design depicting an unusually buxom Liberty, facing left, was criticized by contemporary newspapers as based on his “fat mistress,” an accusation that most modern numismatists believe to be unfounded. Liberty’s head covering was misnamed a “turban” and was repeated often enough that many call these “turban head” half dollars. Actually, Reich intended it as a fashionable headdress, but again, due to misinformation, some believe it to be representative of the Phrygian cap, symbolic of freedom. In the fashion of the era it is properly called a mob cap. 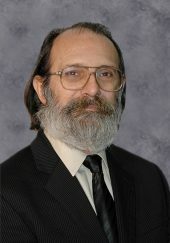 The definition of such and illustrations can be easily found, although the term has eluded most numismatists. Around Liberty, there were 13 stars, seven to the right, and six left, and the date, applied by a four-digit logotype punch, was placed below Liberty’s bust. The reverse depicted an eagle with outstretched wings, holding three arrows and an olive branch in its talons. Above the eagle E PLURIBUS UNUM was incused on a ribbon. The denomination was expressed below as 50C, and UNITED STATES OF AMERICA was on the periphery above. Gobrecht’s modifications in 1836 greatly improved Liberty, resulting in a more refined, even beautiful, effigy, and a reduction in star size on the obverse. 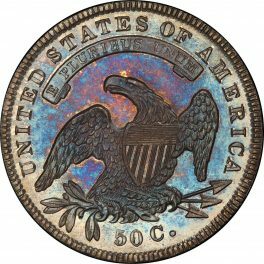 The reverse was left untouched for the most part, with the removal of the motto above the eagle and the new denomination as 50 CENTS being the most noticeable differences. The old style had the denomination as 50 C. Then in 1838, the denomination on the reverse was changed again, from 50 CENTS to HALF DOL. The new steam-press coins of autumn 1836 had the edge reeded rather than lettered as had been seen from the denomination’s inception until 1836. Additionally the diameter was reduced from 32.5 mm to 30mm and in January 1837 the fineness was increased from .8924 silver to .900. Another departure from the Lettered Edge type, was the method of manufacturing working (coining) dies. On the Lettered Edge types, many of the devices were punched into the dies by hand, creating subtle (and sometimes not so subtle) variations which allow collectors to identify the individual dies that produced a coin with relative ease. On the new Reeded Edge type, nearly all devices were present on the master hub, with only the final digit of the date punched manually into the working die. 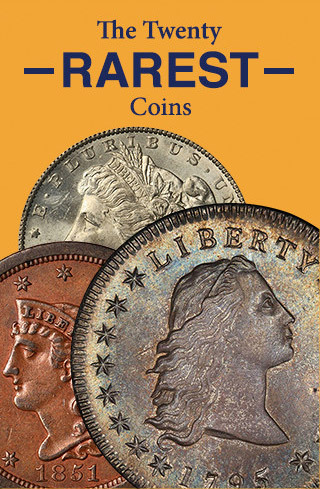 Please click on a coin below to learn more about mintages and values. Keep in mind that we are very interested in buying these and other older half dollar coins. Contact us via email at Info@Coinappraiser.com for more information.